After seeing Natalea's post here, I too decided to try out this craft project from Martha Stewart Living Magazine. I have birds. I have nests. I have pine cones. I have evergreen boughs. I have toilet paper roll tubes. I had all the supplies, so it was a $0 craft with nothing to loose. The fun part is that you can hide small gifts or treats inside the log. If you don't have Martha's magazine, you can see how to make it here. 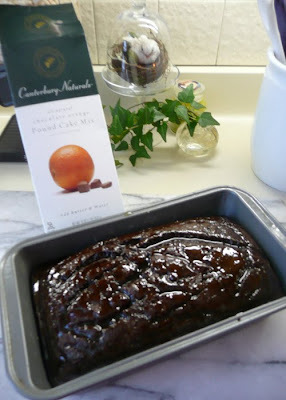 I also made this chocolate pound cake with an orange glaze from a Canterbury Naturals mix I bought at Homegoods. We used to sell this brand at the store I used to manage. Yum! I put together these table favors/placecards for our Christmas Eve dinner using children's mittens found at Target's Dollar Spot. We always have a snowman theme, because our Christmas plates have snowmen on them. 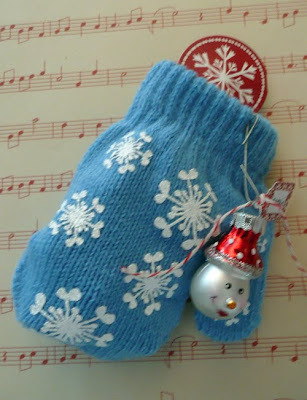 I filled the mittens with candies, a snowflake cupcake topper and attached a wee glass snowman ornament with a name tag. 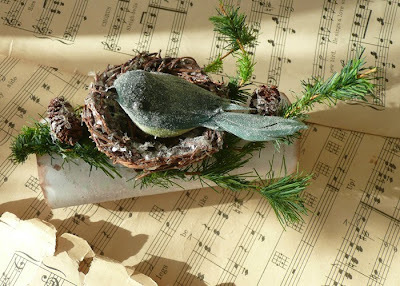 Cindy shows you how to make quick and easy Christmas decorations for your home today over on the Joli Paquet blog. And don't forget to sign up for the chance to win 1 of 5 giveaway prizes by leaving a comment here by midnight today. Love love love your blog! Happy Holidays, and stock up on those mittens. It's frosty here in NY! Love your crafty creations. Those mittens are so cute, what a great idea. I hadn't seen those birds/nests - they are gorgeous. So cute Jeanne! The cardboard roll looks just like a log! AW! Your birdie came out great! I was thinking the same thing-no new supplies- no problem! Have a fantastic week Jeanne. 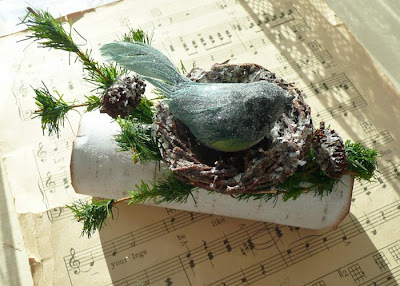 love the bird nest on the log! I think I may have to try making one myself! everything is so festive and fun! ah, i remember seeing that sweet bird craft~ yours turned out really sweet! 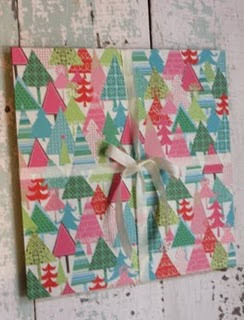 What a lovely post.Love the mitten...Its adorable,wish I had the cake...yummmm. Great! That cake looks yummy! Don't you love Target's Dollar Spot? I do! Love the mittens all dolled up, looks like fun! I wanted to try and make those cute bird and log treat holders...yours came out wonderfully. Love your blog and will be back to visit again soon. Happy Holidays.